Some time in the near-future, an asteroid is detected on a collision course with Earth. Its existence is denied by media and governments, but hackers find evidence of the “truth” in military and governmental computer systems. Damien is a slacker who believes in the asteroid. His plan is to find the safest place on the planet and then move there, but to do that he needs money. So he agrees to smuggle drugs into Korea for a friend; and then he stays on in Seoul to earn more cash by illegally teaching English to the kids of rich Koreans. Sydney is a Canadian prostitute who has been taken to Korea by her boyfriend, Johnny Sandman, and is now working as a model. Johnny, an ex-gangbanger, works for ConGlam, which is some sort of shadowy transnational. One of the projects he is overseeing in Korea is VirtuWorld. This is the brainchild of genetics genius, Dr Kim Da Mi, who also plans to build a faux-European mediaeval theme-park village in the mountains north of Seoul, where her genetically-engineered “children” will survive the impending catastrophe. Lee Mee Hee is a North Korean villager who has had herself smuggled out of the country. By ConGlam. She is taken to China, where she meets a number of other women from North Korea. After they have recovered from their ordeal, they are taken to the purpose-built village in South Korea, where they are to become surrogate mothers for Da Mi’s “children”. Sydney will be the egg donor and Johnny the father. But Johnny proves to have some genetic abnormalities which rule him out. Damien, who resembles Hugh Grant, is a much better candidate. When he learns of this, Johnny is not happy; he’s also losing Sydney, first to a Korean artist and then to Damien, and he’s not happy about that either. Despite having been published by a genre imprint, Seoul Survivors doesn’t read much like science fiction. The near-future it describes so closely resembles the present, it’s hard to determine exactly what are meant to be genre tropes and what are simply setting. There is a vague move in the direction of one or two science fiction ideas – Da Mi introduces Sydney to a therapeutic VR tool; there’s the ProxyBod; and then there’s the asteroid itself lurking somewhere in the background (or not). The world-building is almost wholly reliant on depictions of present-day Seoul, although there are one or two mentions of climate-crash elsewhere and there’s a terrorist attack offstage in London two-thirds of the way through the story. Foyle has chosen to present many of her Korean characters as speaking pidgin English throughout – in fact, the first line of the novel is: “‘Ni-suh, Sy-duh-nee – Omhada – look at camera – thank you – better – pro-fesh-ional – Now, play with Hot-Cold, plea-suh!” Though this may give the narrative some verisimilitude, these days it’s a difficult trick to pull off without causing offence. And, annoyingly, Foyle refers to the mobile phone throughout as a MoPho rather than mobile or cell or the actual term the Koreans use (which translates “handy phone”, apparently). None of this, in and of itself, prevents the book from being readable and entertaining, but the cast are something of an obstacle. Sandman is racist, sexist and violent, thoroughly unpleasant, and responsible for several incidents of sexual violence which leave a sour taste. Damien is passive and not very interesting. Sydney is none too bright, while Mee Hee Lee is unworldly and naive. Even Da Mi is self-centred and arrogant and far from likeable. It’s not a particularly edifying group of characters on which to hang a story. There’s a feeling throughout Seoul Survivors that it’s a book whose whole is not greater than the sum of its parts. While there are some well-handled set-pieces, the story-arc is sign-posted far too blatantly, and the violent climax comes across as somewhat cartoonish because it tries to resolve all of the narratives at once. 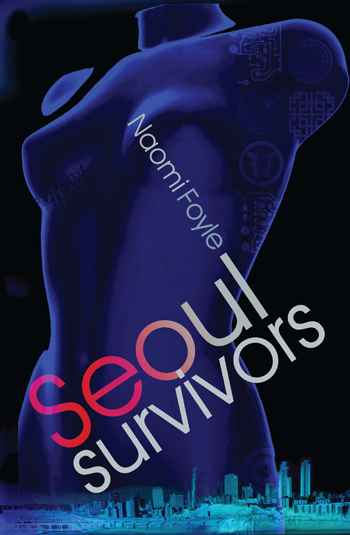 The advance publicity calls Seoul Survivors a “cyber thriller”, and it certainly feels more like a thriller than science fiction. Whether this is a strength or a weakness… is hard to say. This review originally appeared in Interzone #247, July-August 2013. Categories: book review, books, interzone, naomi foyle, science fiction, women in sf | Tags: book review, interzone, naomi foyle, science fiction, seoul survivors, women in sf | Permalink. I promised a book haul post and here it is. Unusually, this month’s haul consists chiefly of research books, and first editions for various collections. Which actually probably makes it a little more expensive than is typical… Oh well. More research. Sort of. Sealab I bought just because it looked interesting. And as the bookmark indicates, I’m about a third of the way into it and it is interesting. Fascinating, even. I may well post about it later. The Very Short Introductions – Utopianism, Communism and The Soviet Union – are quite useful research tools, though they’re obviously only starting points. The Russian Cosmists is for a novel I’m working on. I started the novel the year before last when I had a bash at NaNoWriMo. I managed 15,000 words before giving up, but I recently realised that if I restructured it and took the plot in a different direction, I could end up with something quite interesting. A bunch of genre works. The Dog Stars was shortlisted for the Clark Award this year. I found that copy in a charity shop. The Lowest Heaven is an ARC of the latest anthology from Anne Perry and Jared Shurin. This ARC is just the stories, but the finished product will apparently contain a number of astronomical photographs. It’s due out next month. Seoul Survivors I have to review for Interzone. And The Maker’s Mask is a self-published work I stumbled across on Amazon. From what I’ve read of it so far, it seems quite fun. Some signed genre collections. I’ve been a fan of Varley’s fiction since the early 1980’s, so there was no way I was going to miss buying Good-Bye, Robinson Crusoe, even if I have most of its contents in other collections. Trujillo I picked up cheap on eBay. It’s out of print and difficult to find – especially the slipcased edition. I also have the Night Shade Books edition, although this PS Publishing one includes the title novel and some additional short stories. Living Shadows was another cheap eBay purchase. These, er, weren’t cheap. The Alien Sky and A Male Child are first editions of Scott’s first and third novel, from 1953 and 1956. Despite the enduring popularity of The Raj Quartet, Scott’s other works are really difficult to find – especially the early ones. 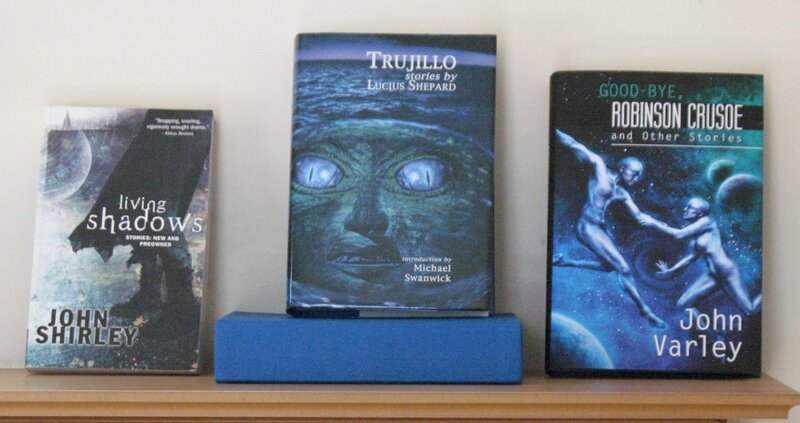 Happily, a Cambridge-based bookshop put some of his books up on eBay recently. So I bought them. Hear Us O Lord from Heaven Thy Dwelling Place is a 1962 first edition of Lowry’s first posthumous collection. It contains ‘Through the Panama’, which is currently one of my favourite pieces of novella-length fiction. It was sold by the same shop as the Scott novels. Finally, My Appointment with the Muse is a posthumous collection of Scott’s essays and talks. 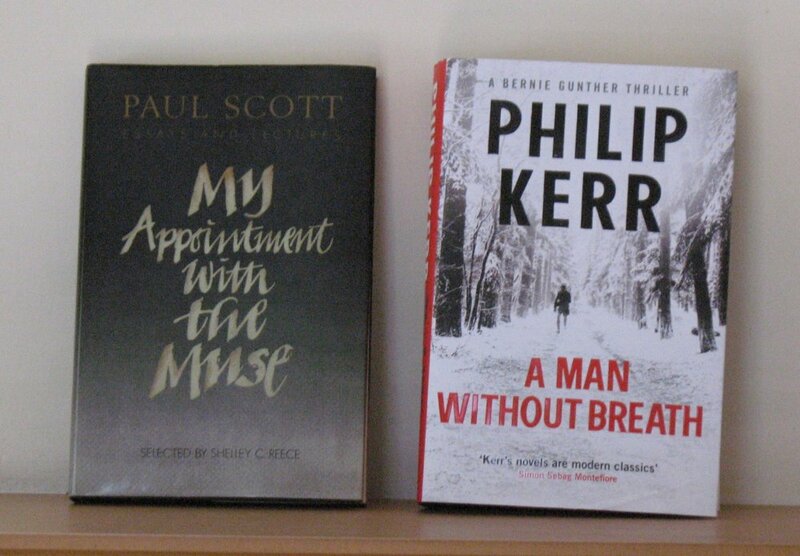 A Man Without Breath is the ninth and latest in Kerr’s Bernie Gunther series. I only have to read the novel prior to this one, Prague Fatale, and this one and I’m up to date. Categories: book haul | Tags: ankaret wells, john shirley, john varley, lucius shepard, malcolm lowry, naomi foyle, paul scott, peter heller, philip kerr | Permalink.